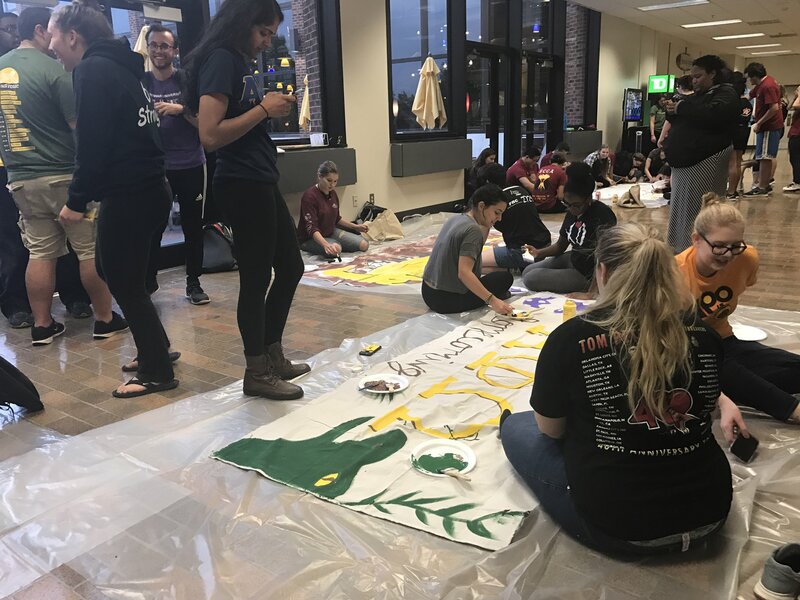 Students painting banners in the student center for Homecoming "PROFhistoric" 2017. -Staff Photo/Sarah Jane Massaud. Rowan University’s 2017 PROFhistoric Homecoming week took off without a hitch, despite the morning’s gloomy weather due to Hurricane Nate. While the weather had cleared before the banner competition had started, the event was relocated from outside on the back patio of the Student Center to the inside of the Student Center. 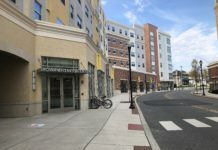 “I like that we now, in our own way, get to honor the people who have already given back to the school so much,” said senior marketing major, Alexis Dobron. 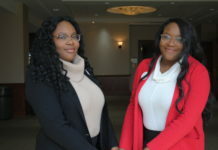 Students get a chance to show alumni what their school is becoming as well as show appreciation for alumni paving the roads to success for those coming after them. Students worked on their banners from 5 p.m. until 10 p.m. The banners will be displayed throughout the Student Center all week long. The winners of the competition will be announced during halftime at the Homecoming football game against TCNJ. Fall flavored snacks were available in the pit halfway through the event. Apple cider donuts, apple cider, apple pie and even apple slices were donated to the event from Gourmet. Free Homecoming T-shirts were distributed to those who attended the event. 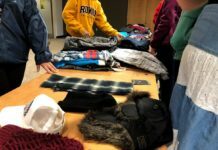 Students were also able to donate to Rowan’s SHOP, a pantry for Rowan students to take food when they need it. An empty shopping cart was displayed next to the sign-in booth stating, “Waits to be filled with donations.” Throughout Homecoming, extra spirit points are awarded to those who donate.